I have a 48" Disston 400 that is a great saw for smaller top bound logs because you can get a wedge in sooner than a regular bucking saw. It is a straight back slender saw that has only one handle hole, sorta a cross between a falling and bucking saw. 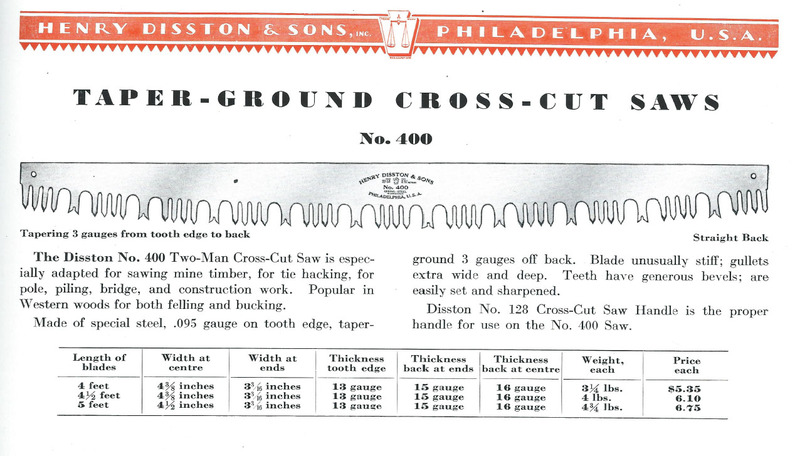 The Disston catalogs I have show this saw was only made up to 5 feet in length. I see advertised a 6.5 foot saw with the model number 400 in the etch along with "Columbia" and "Warrented" in the etch. This saw has a straight back and only one handle hole same as the Disston 400 however the tooth pattern is more like a Simonds 513 than the Disston saw I have. Does anyone recognize the Etch and know the saw manufacturer of this saw? I wonder is the Columbia name is an independent store brand. Many hardware stores rebranded common saws with their in house brand.